The increasing use of diagnostic imaging has uncovered a large reservoir of previously undetected thyroid nodules and cancer. The escalating prevalence of low risk thyroid cancers coupled with stable mortality rates necessitates an efficient risk stratification system for evaluation of nodular disease. Given the indolent nature of the majority of low risk thyroid cancers and the potential morbidity associated with surgical management, interest in the use of alternative strategies to manage small thyroid cancers has risen. Meanwhile, the incidence of advanced stage thyroid cancer is also increasing, and these patients are at highest risk for recurrence and possibly mortality. Imaging is especially critical in defining the extent of disease for this patient population so that surgery can be appropriately planned to gain the best oncologic outcomes. Through a combination of lectures, panel discussions, and case-based presentations, this course will explore the role of various imaging modalities in the evaluation of patients with thyroid disease and examine the clinical indications for various image-guided therapies for management of thyroid nodules and cancer. 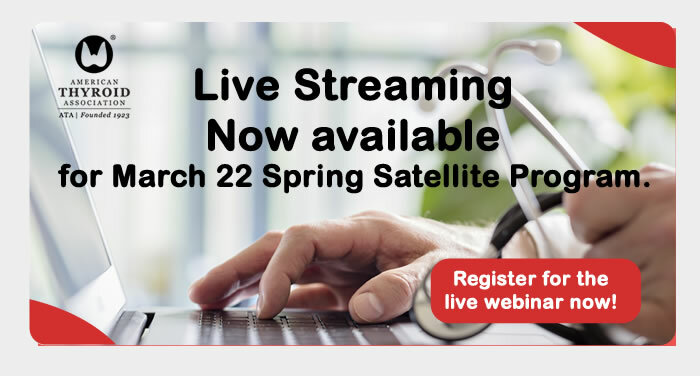 The 2019 Spring Satellite symposium is open to the community of endocrinologists, internists, surgeons, oncologists, basic scientists, nuclear medicine professionals, pathologists, trainees, nurses, physician assistants, nurse practitioners and other healthcare professionals who wish to broaden and update their knowledge of the thyroid gland and thyroid cancer. Continuing Medical Education (CME) and Maintenance of Certification (MOC) credit available. Tabletop exhibit space available. Inquire at meetings@thyroid.org with questions and interest. Sponsorship opportunities available. Inquire at meetings@thyroid.org with interest.